Training your dog in general can be one of the most difficult tasks alone, but when you’re thinking about training your companion to accompany you on a hunting trip there are many integral steps that you’ll want to follow to ensure complete success. Your first order of business will be to research different breeds of water dogs. Look at different breeds such as Labrador Retrievers, Golden Retrievers, and Springer Spaniels and decide which one would be best for you. Once you identify which breed is right for you, go out and pick a puppy. A puppy will allow you time to train for your own hunting style, but it will also time to bond and condition the dog as well. 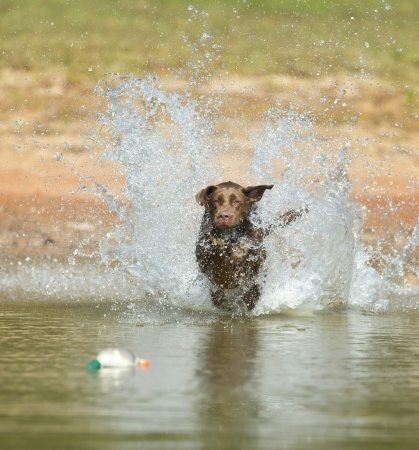 You’ll want to introduce the puppy to the water when they are little in order to instill the idea that the water is good, fun and playing in the water is a way to earn rewards. Along with this, you’ll want to also teach the dog to sit and stay. You can use food as a way to teach sitting by holding it over the dog’s head and giving the commands to sit and stay. Eventually the dog will sit and stay without the use of a treat. Next, introduce the dog to the scent of a waterfowl and a waterfowl decoy so he or she learns what they look and smell like. Continue to practice this as often as possible, rewarding the dog with positive reinforcement and rewards. Once the dog is ready, expose it to your actual hunting situations before taking it out. The dog needs to hear your gunfire repeatedly so it is used to it when part of the actual scenario. Keep repeating all of these steps over and over again frequently, and don’t be afraid to keep these training methods simple. Once your dog is ready you’ll have a trusted companion to help you hunt all the waterfowl you can get.